Beatrice is a rogue witch. Unlike many catalyst-wielding sorcerers throughout the land, she did not learn her magic at the Vinheim Dragon School. Her catalyst's description heavily implies that she originates from a long legacy of witches, from which she presumably inherited her knowledge on sorceries. 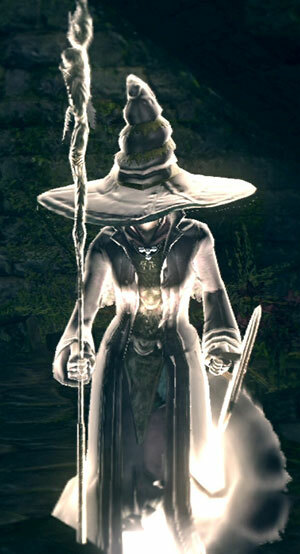 The flow of time in Lordran is distorted. After helping the chosen undead fight the Four Kings, she tried to fight them herself, but died trying. Can be summoned to help the Moonlight Butterfly boss fight. Her soul sign is hidden under some shrubs at the base of the tower, underneath the staircase. Can be summoned to help you with the Four Kings boss fight but only if she was summoned for the Moonlight Butterfly fight before. If you're looking towards the bridge with the white light door that leads to the Four Kings, turn right and you'll see a column, her soul sign is behind and to the right of this column. This is not recommended though, for the damage she deals to the kings before dying is usually less than the HP the kings gain if you fight them as a pair. The game will automatically vanquish phantom Witch Beatrice if you wander too far away from her. 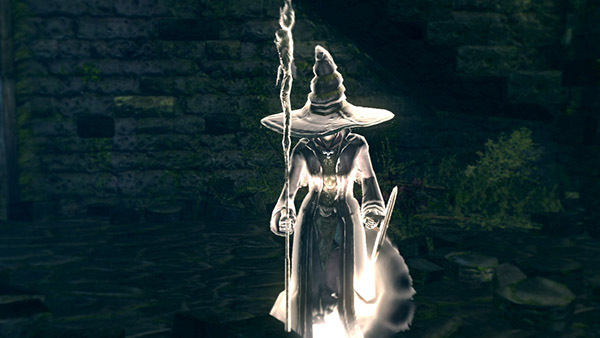 If you summon her to help you against the Four Kings and drop down to the Abyss from the highest point of the tower, just after traversing the white light door, there's a high probability that she will be removed (vanquished) as the distance from you to her can be enough while you're falling. To ensure this doesn't happen, walk down the staircase in the tower until you reach the first straight piece of floor that connects to the next set of stairs, wait there until Witch Beatrice catches up with you and then drop down into the Abyss. After defeating the Four Kings, her corpse (containing the Witch Set and Beatrice's Catalyst) can be found in the Valley of Drakes, near the New Londo Ruins shortcut on the opposite side of the valley from the entrance to Blighttown. Note that her corpse will appear here whether or not you summoned her for the Four Kings or Moonlight Butterfly boss fights.